1. About what percent of the dependent variable is unexplained by the below described model? Round to the nearest percent. Click image to enlarge. SSE = SSR. That is, the Sum of the Squared Errors is equal to the Sum of the Squared Residuals. SSM = SSE. That is, The Sum of the Squares Modeled is Equal to the Sum of the Squares Explained. 3. Given the example STATA output below, which of the following are true? Click image to enlarge. 4. Given the example STATA output below, enter the value of R^2 to 6 decimal places. Click to enlarge. 5. 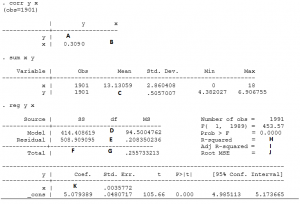 What does the following statement do in STATA? 6. Given the regression below, which statements are true? The model as a whole is not statistically significant as demonstrated by the F test. 7. Suppose we define the correlation between X and Y as rho, given below. Which coefficient of correlation have we measured? 8. 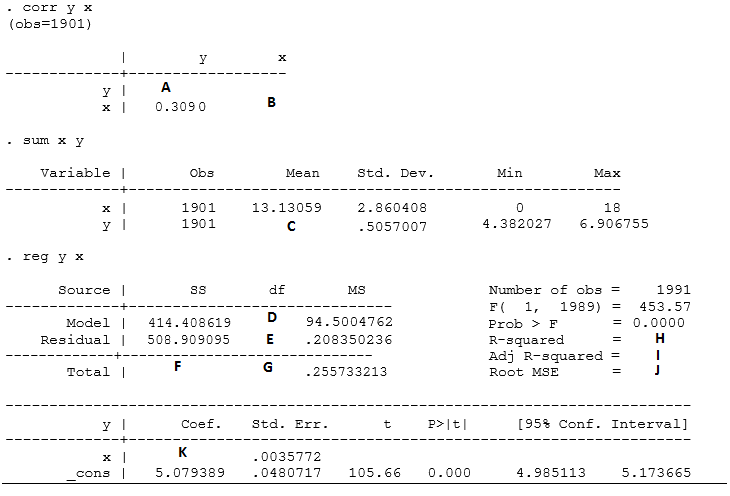 For an OLS regression, how do we calculate Root MSE? Take the square root of the mean of the sum of the squared residuals. Take the square root of the mean of the residuals. Take the k-root of the standard error. 9. What is the correlation between obama and income below? Round answer to 3 decimal places. Click image to enlarge. 10. Given the example STATA output below, what is K? Round to the nearest thousandth. Click image to enlarge. 11. Given the example STATA output below, what is C? Round to the nearest tenth. Click image to enlarge. 12. Which of the following are correct? 13. Given the example STATA output below, what is D? Click to enlarge.